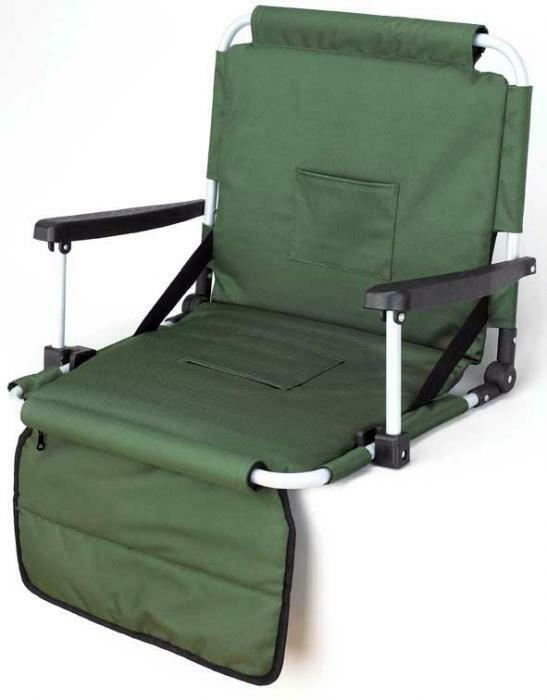 The Picnic Plus Folding Stadium Seat is the only stadium seat on the market with such quality built-in arm rests. The unique and top-quality construction of this stadium seat also features a velcro fastening system for fixing your mobile R&R firmly in place to bleachers. 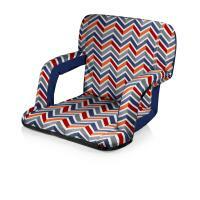 The Picnic Plus Stadium Seat also features a super-handy front storage pocket and is fully padded for maximum comfort. When it's time to go, it folds flat and can be easily transported with an intuitive handle and padded shoulder strap. 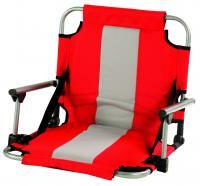 This stadium seat is made with a sturdy aluminum frame and can hold up to 225 lbs. safely. The item is sturdy and comfortable. Great product. I would definitely purchase this again. It is comfortable, a great way to sit in bleachers for an extended length of time! This is a very lightweight and comfortable chair! Easy to set up and fold up. It makes the high school football season much better! The chairs are great, easy to use and very comfortable! This is a great product and super, wonderful service! I sent this as a gift and the recipient was extremely pleased. They said it was the best stadium seat he had ever seen. I was really pleased with the product. The extra pockets for snacks are very handy. The width adds for more comfort. This item is easy to use, very durable and sturdy. It is very good quality. This is lightweight, comfortable, easy to store, pack and carry. It is sturdy and easy to handle. It lives up to it's advertisement. This is a top quality item! It will be perfect for sporting events. I like the stadium seat very well. Its made with extra features like the two pockets for the warming packs, and the small zippered pouch. It also has the larger flap over storage like the other seat I have. I like this stadium seat better than the one I have, because the seat back sits you up straight and the other one I have leans back and tends to get in the way the of the people sitting behind me. I would buy this stadium seat again! Thank you. It was a gift to my father and he was very impressed with the chair. It was exactly what he wanted for back support on bleachers. This is the best stadium seat that I have found. It is a foam padded seat and has places for heaters to keep me warm! Large Velcro straps connect to bench. I have used it all season and find it much more comfortable than the cold steel bench. This is excellent customer service and just outstanding. I love the stadium chair and couldn't be happier! This is everything that I was looking for! 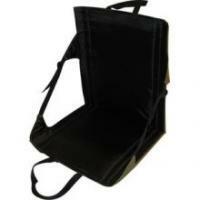 It is comfortable, lightweight, easy to carry and is made of quality materials! 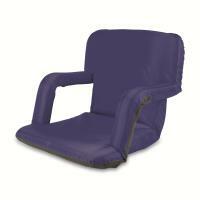 I plan to use this product a lot because my son plays football and I had seen this type stadium seat which appeared to give a little more comfort and support. The seats are of good quality! The stadium seats are great! We do like the seats. 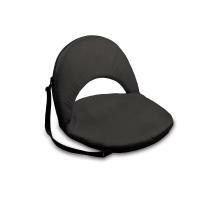 This chair is fairly easy to carry and has places to store things. The padding on the seat is nice too. The seat provides a more stable seating than cushions or some other type seats. 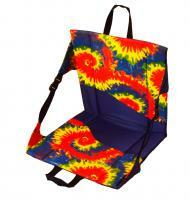 It has plenty of storage, fold easily and has shoulder strap making for easy carrying. It is very sturdy and comfortable. It is the best out there! We found the stadium seats met our needs. It appeared to be constructed and designed well. We liked the compartments that held our field glasses and water. We have received many comments about the color, pockets, and etc .All of them have been are positive. I take this seat with me to all the football games. It is the best seat I have ever had. It is very sturdy and I like the back support. There are a couple pockets that I can put water bottles and snacks in for later in the game. I was happy with this purchase. The back is not as comfortable as expected, otherwise it's OK. Fairly comfortable, but the arms are not adjustable for height. This seat is well made. However, fell a little short on the way it attaches to a seat. The chair is comfortable on bleachers but the seat needs more padding. You can still feel the bleachers coming through. The product is comfortable! It is easy to carry and wonderful to un-velcro and use. This is a nice chair, and certainly suited the purpose of making watching football games more comfortable. The seat itself is nice, but the way it fastens to the bleachers is terrible. It fits very loose, and you can't relax and lean back. It leans to far back, because you can't tighten the straps enough. It needs the front hooks, like some of the other ones I've seen. A complete waste of money. Foolishly I bought 3 of these seats to go see an outdoor performance. The back of the seat has a metal frame and on top a rubber bumper. But when I sit back against it, all I contact is the metal frame and none of the fabric. It was so uncomfortable the only way I could use it was to place a large pillow on the fabric back support to keep my back off of the metal frame. I will never sit in this thing again. It ruined my outing it was so uncomfortable and actually gave me a pain.